Increasing the rate at which you win new business is the objective of win loss research and analysis. The process can help you acquire valuable perspectives on why your prospects buy or reject your products and services; how your company is perceived relative to your competitors; what aspects of your sales process need to be strengthened; and, how your sales team should be organized and trained. Win loss results also can be used as a coaching tool with individual salespeople by giving them access to precise and accurate feedback on how they are doing their jobs. 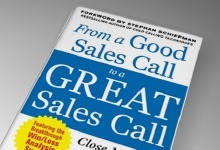 Reading and hearing candid feedback from clients and prospects is invaluable for a salesperson because it enables him or her to make adjustments and calibrate his or her sales techniques to the evolving competitive dynamics of the marketplace. In the Anova Consulting Group’s experience, a company’s top salespeople are the biggest promoters of win loss sales analysis because they recognize it can help them “raise their game”. In Anova’s experience, a company’s top salespeople are the biggest promoters of win loss sales analysis because they recognize it can help them “raise their game”.